Quanser Engineering Blog - Your Comments Welcomed! : Quanser wins BIG at the Markham Business Excellence Awards! Quanser wins BIG at the Markham Business Excellence Awards! The Board of Trade of the City of Markham, Ontario hosts an annual Business Excellence Awards ceremony to celebrate the business achievements of the 10,000+ companies in Markham. This year, Quanser was nominated for the Innovation award and secured a spot as a finalist. The awards gala was held on November 17 and a table full of Quanser execs and engineers were there to represent the company. The final award was announced for the most innovative company in Markham and the winner was...... Quanser!!! 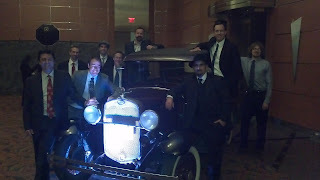 The theme of the awards gala this year was the Roaring 20s, if you're wondering why we're all posing around the classic car. I was able to capture the occasion on my cell phone camera, so please forgive the amateur videography. Congratulations to the whole Quanser team, as this award represents the skill and dedication of the entire company to make us world leaders in innovative solutions for educational and research technologies.